“Grow The Change” Work Day at “Ka Hale A Ke Ola” with “Rumi” and friends. Our overall intention is to establish a communication and resource network. The campaign actually has three interlocking components. Firstly the Video Fest (which will be a weekly online broadcast) and will showcase diverse bands from around the world with Hawaiian Culture and music as it’s centerpiece thusly perpetuating the Spirit of Aloha and create a worldwide bond between socially and politically conscious bands from around the world. We will also be working with the “Music is the Medicine” Foundation. Musicians in the festival include representatives from Portugal, India, Germany, The Phillipines, the UK, and various and sundry other parts of the world, including Texas. 3. Serve as an outreach for the many native people who have found themselves homeless on Maui and the Other Hawaiian Islands. And thirdly, to help establish a warrior sanctuary for sufferers of PTSD (hopefully to be named the Queen Kaahumanu Center, given permission). A wonderful and painfully true story of perseverance, respect, honor and resilience. The author, John Lancaster, speaks with Uncles of Old, the troubled youth, and about the ongoing shame of homelessness and alienation in the Hawaiian Islands. Although tens of thousands of recreational surfers have enrolled in colleges and universities over the decades, and coastal-area college surf teams and clubs have been around since the mid-1960s, surfing and the academy have had little effect on each other, and connections between the two are still for the most part regarded as novel, quirky, or gently amusing. Just a small number of well-known surfers have earned graduate degrees of one kind or another, including Ricky Grigg (Ph.D., oceanography, Scripps Institution, 1970), Peter Cole (M.S., informational sciences, University of Hawaii, 1971), and Sarah Gerhardt (Pd.D, physical chemistry, UC Santa Cruz, 2003). The number of first-rate academics who also surf is proportionally small, and includes Kary Mullis, a San Diego longboarder and 1994 Nobel Prize winner in chemistry; the late Donald Cram, another San Diego surfer, who earned his chemistry Nobel in 1987; and Garrett Lisi, yet another San Diegan, and the brains behind the physics-based “Theory of Everything.” It is estimated, meanwhile, that between one-third and one-half of the world pro tour’s top 44 surfers in any given season are high school dropouts. 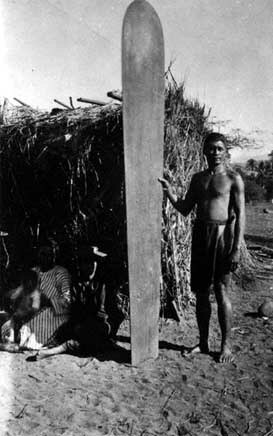 One of the First Known Photographs of a Surfer with his Board, c. 1890. Courtesy Bishop Museum Archive. In 1851, the Reverend Henry T. Cheever observed surfing at Lahaina, Maui and wrote about it in his book, Life in the Hawaiian Islands, The Heart of the Pacific As it Was and Is. Thomas Green snapped this photo of Dane Flinn fading left on his 9’2 Surf Thump. Join Pacific Whale Foundation researchers and volunteers for this annual citizens’ count of the humpback whales that can be viewed from Maui’s coastline. During this count, you’ll learn more about whales and whale research methods, and you’ll meet others who share your interest in whales. There’s no cost to participate, and all the equipment is provided. If you are interested in volunteering, visit Pacific Whale Foundation’s volunteer website. Click on “SIGN UP!” and create your own username and password. Please do not choose any events until you have received an email confirmation that your username and password have been accepted. You can then login again to select the events and shifts that you want. Registration for this event opens in mid-January. Due to the scientific nature of this event, the number of volunteers Pacific Whale Foundation can accept at each site is limited and positions fill up quickly. Thanks for your support and happy counting! Join Pacific Whale Foundation for a whale photography workshop at sea. Whether you are a novice or an experienced photographer, this unique hands-on adventure will help you learn and practice expert techniques for photographing whales and other wildlife. Bring your own digital camera, or rent one (Canon PowerShot) from our Ocean Store. This cruise is timed to include the golden light of sunset and is led by a Pacific Whale Foundation naturalist and a photographer from Pacific Whale Foundation’s Adventure Photo staff. During your three hour cruise, you’ll discover the most effective camera settings for our local conditions at sea. You’ll also learn about proven digital photo techniques to maximize each opportunity presented by the whales that you encounter. We’ll also take a break from photography to drop an underwater hydrophone into the water to listen to live whale songs. Book online www.pacificwhale.org/content/whale-photo-safari-lahaina or call 808-249-8811 ext. 1 anytime between 6am-9pm. Discounts available for PWF members and for kama’aina. Pacific Whale Foundation is a non-profit organization dedicated to promoting appreciation, understanding, and protection of whales, dolphins, coral reefs, and our planet’s oceans. This is accomplished by educating the public — from a scientific perspective — about the marine environment. Pacific Whale Foundation supports and conducts responsible marine research and addresses marine conservation issues in Hawaii and the Pacific. Through educational ecotours, Pacific Whale Foundation models and promotes sound ecotourism practices and responsible wildlife watching.